Dam removal? It's already happening! Check the map and the case studies. The Yecla de Yeltes Dam is located in the Huebra River in western Spain, Salamanca Province (Castilla y León Region), on the border with Portugal. This barrier is within a Special Protected Area (SPA) for birds and a Site for Community Importance (SCI), which are both sites of Natura 2000 network. This 22m high dam was built in 1958 to supply drinking water to the village of Vigudino. However, the dam is no longer working and has a strong negative impact in a great nature area of graze lands, oak trees and limited population. 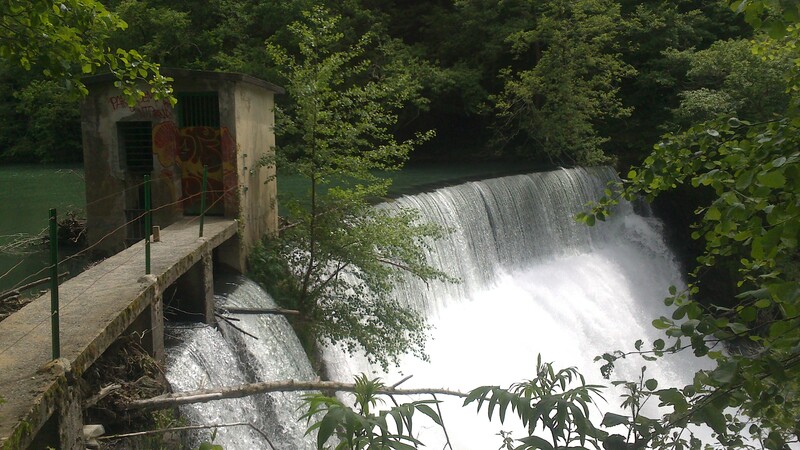 The water rights had recently extinguished and the Duero River Basin Authority (Confederación Hidrográfica del Duero, CHD) decided to remove the dam. CHD is responsible for the water management of the Spanish Duero Basin and for the maintenance of the infrastructures they own in their watershed. They facilitate the use of water by agriculture, drinking water production, recreation and nature. But also, when man-made barriers are no longer in use they consider the removal of those to avoid maintenance costs and to improve the ecological state of their rivers. On April of 2018, CHD started the demolition of the Yecla de Yeltes Dam and thanks to this, 27km of river were reconnected. Several species will benefit with this obsolete dam removal, like for example: otter, European pond turtle, trout and the endangered endemic species Sarda (Achondrostoma salmantinum). it will improve habitat conditions of the river resulting in a general improvement of the parameters that are used to assess the conservation status (ecological status as defined by the Water Framework Directive) because it will contribute to re-naturalize this river stretch. Inturia dam is located in Leitzaran River (Oria River Basin), in Elduain Municipality, Gipuzkoa Province (Basque Country, Spain). Leitzaran is the biggest tributary of the Oria River, with 44km long. It belongs to Natura 2000 and it is catalogued as a protected biotope. This dam was built in 1913 with the only purpose of regulating the river’s flow, especially in summer. This dam was also part of the hydropower dam system of Bertxin, located downstream. Inturia dam was 12m high and it was completely filled with sediments. It affected negatively to the longitudinal connectivity for fauna migration, free sediment movement and good spawning grounds. Due to the high sediment accumulation behind the dam (236,000m3) the demolition was planned in 4 different phases. The first and second phases were done in 2013 and 1014, thanks to the project GURATRANS (EFA221/11), transboundary project of Spain-France-Andorra Cooperation, co-funded by FEDER, with the collaboration of Navarra, Atlantic Pyrenees and Basque Country entities. The third and fourth phases were done during 2015 and 2016, and were part of the IREKIBAI LIFE project, in which Gipuzkoa Regional Government, Navarra Regional Government, the Basque Water Agency, GAN (Environmental Management of Navarra) and HAZI collaborate. The demolition works were carried out by the Basque Water Agency. Robledo de Chavela dam, located west of Madrid Province, was built in Cofio River to supply water for Robledo de Chavela Municipality. It began working in 1968, but in 1990 it stopped supplying water because the water started having quality problems due to livestock facilities dumping to the river. In February of 2004, Tagus Basin Authority communicated to the dam owner, Robledo de Chavela Town Hall, the expiration of the water use license due to the dam abandonment status. In June of 2012, Tagus Basin Authority became aware of a water leakage of the outlet of the dam base spillway and it was not possible to be repaired due to the irreparable condition of the gate mechanism. Therefore, Tagus Basin Authority started the necessary steps to start with urgency Robledo de Chavela dam demolition, to avoid a high mortality of fish and also a possible sediment problem downstream, which could affect the water supply for the city of Madrid. Before the reservoir was emptied, several electro-fishing trips were done to save as many fish as possible. Also, the sediments accumulated in the reservoir were tested to check if they were contaminated with heavy metals, but the analysis revealed that the sediments could be re-use to restore other areas because there was no hazard of contamination. Erected in 1922 as a hydropower concession, about 800 m downstream from the confluence of the Vienne and Creuse rivers, the Maisons-Rouges dam maintains a level difference of about 4 m (downstream of a basin area of about 20,000 km2). Built initially to supply a paper factory, it was integrated into EDF’s assets in 1950. As this dam is the nearest obstacle to the sea, at the confluence of major rivers, its particular situation created a substantial impact on numerous species of migratory fishes. Particularly the salmon, already suffering from reduced access to a part of the spawning grounds, had disappeared. The shads have found shelter in remaining spawning sites downstream of the dam with problems of hybridisation between two species of shads (or aloses) : between the allice shad (alosa) and the twaite shad (alosa fallax/alosa firta). The different fish-passes had a very low efficiency and the various salmon reintroduction plans undertaken on the Gartempe river (which is one of the Vienne river’s tributaries) had no significant result. According to the ” Loire Grandeur Nature ” (Natural Loire river plan) which was adopted on January 4, 1994, the Government decided that the dam’s licence would not be renewed at its expiration date of 31st December, 1994 and that the State, becoming the site’s owner at the termination of the concession, should undertake the removal of the work, due to the importance of the impacts which could not be balanced by any sufficient economical interest. The contracting responsibility was the State’s (Ministry for the Environment and territorial planning). The demolition was led by the Indre-et-Loire department of Transport, Urban Planning and Construction Directorate and the actual works were under the responsibility of EDF. The cost of the operation was about 2,2 million € (1998 : 14 million French Francs), mainly financed by the Ministry for the Environment and Territorial planning with the participation of the Loire-Brittany Water Agency. The main difficulty was due to local opposition as several rural villages would suffer important local tax losses after the dam’s removal. In consequence a complementary plan of economic assistance was set up, at the same level of financial importance as the dam removal cost. Important financial assistance was granted by the State, the water agency, EDF and the Regional/Provincial authorities to support local development operations. The removal operation was carried out in the summer of 1998, after the technical difficulties had been resolved by the contracting authority. Once half of the site was isolated by cofferdams able to maintain the required water storage for the irrigation of cultivated land, the removal operation essentially consisted in cutting the three sheet-pile curtains with an oxyacetylene cutting flame and pulling down with a mechanical excavator the embankment between these sheet-piles. A drowned sill was made up at the bottom of the river bed, so as to avoid erosion that was foreseeable because of historically extensive sand extraction in the bed of the Vienne and Loire rivers. This also helped to slow down the migration of the sediments found upstream the reservoir. The sediments consisted of sand and did not raise any problems of quality. Many agricultural pumps which used the reservoir water were restored by the State (this cost being included in the total operation cost). However, a camping site near the confluence about 800 m upstream the dam, did suffer a ground slide and one of the houses shows a few cracks, probably due to a change in the flow of the ground waters resulting from a lowering of the storage water level by 4 m.
The shads very rapidly benefited from the removal of the dam : 433 shads were caught in the river Vienne in Châtellerault, about 20 km upstream of Maisons-Rouges (i.e. 91 from the fish pass and 342 from a fish removal operation ; 156 fish were released upstream of the dam) ; and 15 on the Creuse river downstream of Descartes, about 12 km upstream from Maisons-Rouges. Active spawning sites were observed on the Vienne river in Châtellerault and on the Creuse river l’Ilette. Lampreys were observed on the Vienne river down-stream of the Châtellerault dam, and consequently a new population of lampreys re-colonised the Creuse river up to Saint-Gaultier, the Gartempe river up to Saulgé and the Anglin up to Cancrenier. The presence in July, 1999 of a living salmon, 88 cm long and weighing 4,8 kg, in the Gartempe river at Châteauponsac in the Haute-Vienne department is a very encouraging sign. No living salmon had been observed so far upstream since the 1920s, when the Maisons-Rouges dam was built. The symbolic return of the salmon, after that of the shads and lampreys which was observed last winter, confirms the positive effects of the removal of the Maisons-Rouges dam on migratory fishes. The Chinon University is monitoring this experiment. The first results show that the river bed is dynamically coming back to its initial state. The construction of a dam in the village of Saint-Etienne du Vigan was authorised in 1895 to supply electricity to the town of Langogne (Lozère).Being approximately 12 m high and having no special fish pass for migratory fishes, the dam had sterilised the excellent Upper-Allier salmon spawning sites. At the time of construction, strong protests were uttered, in vain, by the rural people for whom the fishing supplied a considerable additional income. The town of Langogne rebuilt the dam in concrete a few metres downstream from the first 1895 dam which had become partially ruined. Electricité de France (EDF) became the owner of this dam in 1950. Under the implementation of the ” Plan Loire Grandeur Nature ” (the Natural Loire River Plan) which was adopted on January 3rd, 1994 by the French Government, the Prefect did not renew the authorisation for this dam when it expired on October 16th, 1994. The French Government requested EDF to remove the dam at their own expense in order to restore the free running flow, in conformity with the 1919 law. 1 Million € (1998 = 7 million French Francs) was covered mainly by EDF, helped by a contribution from the Loire-Brittany Water Agency. The start of the demolition was delayed until a small flood occurred so as to reduce the risks of pollution during the storage draw-down operation. The removal was performed with explosives on June 24th, 1998. The sediments at the bottom of the reservoir were of a very good quality (sands and gravel) and no pollution could be seen. The site has rapidly returned to a near-natural state and five spawning sites were found in the winter 1998-99 upstream of the former dam location.